Whether you’re doing crossfit, yoga, swimming, boxing, roller derby, Brazilian jiu-jitsu – you name it, we’ve got something here for you. What do you usually carry in your gym bag? Sneakers, gloves, protein bars, laptop? Are you still carrying around that ugly and sweat stained gym bag that you got for free 5 years ago? You want gym bags to be able to handle abuse, to be functional, lightweight, yet big enough to carry all your gear, and of course, you want something to look good too. Your search for the best gym bag ever ends today! 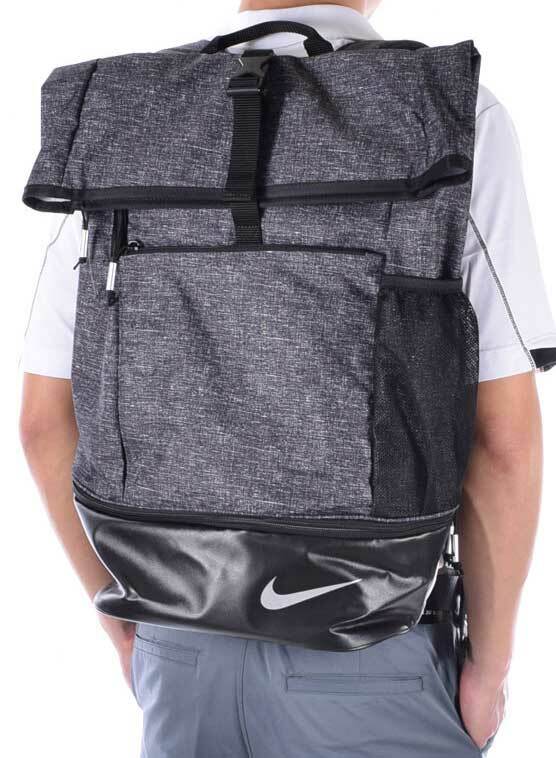 This is a very nicely sized backpack, with two extra-large zippered compartments that can carry your shoes or cleats, and a basketball or a soccer ball. 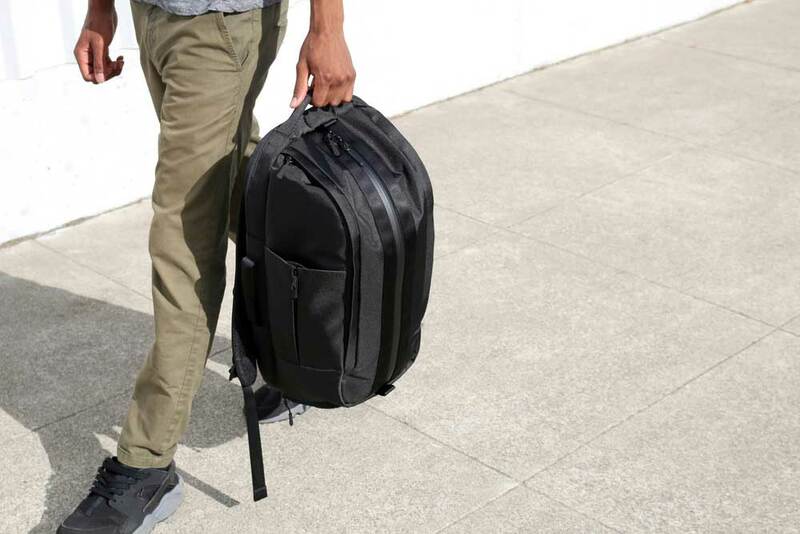 This is a large backpack that can swallow a lot of gear, but despite the size, the design is very sleek, and it doesn’t look too bulky. The branding isn’t over the top too, which helps in keeping a clean profile. 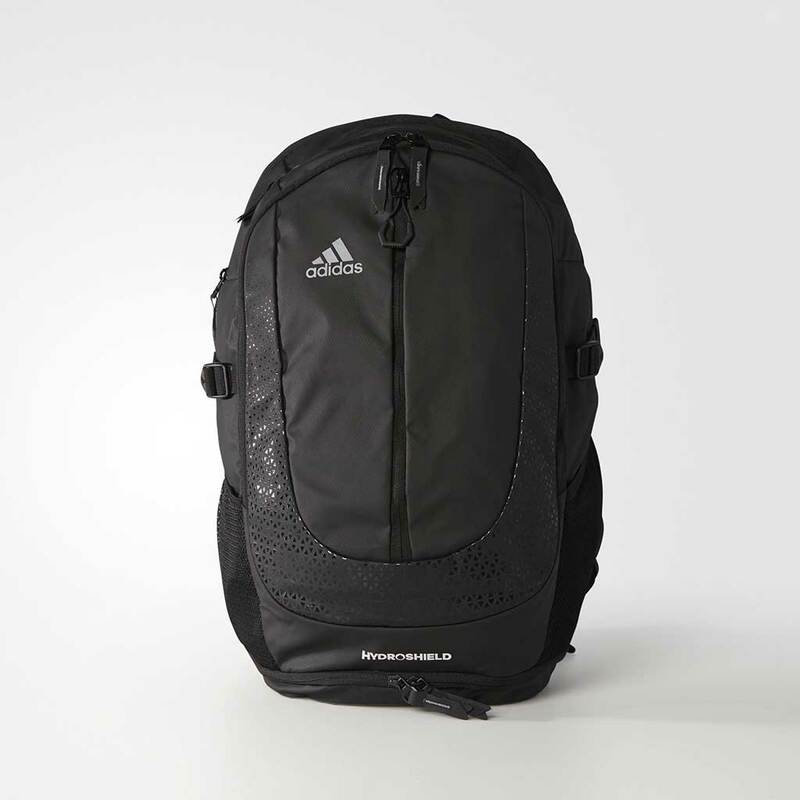 Buy the Adidas Primero II Backpack on Amazon. First things first – this is a relatively large backpack, so if you’re on the smaller side (5’4” and below) this may not be for you, unless you carry around a lot of gear. Even then, you likely won’t want to use this pack to pull double duty as an everyday backpack. But if you need to schlep around a lot of gear (or books! ), this is the pack for you. It has a pseudo-roll top like design, but instead of a roll, the top closes with a single fold over flap and a single buckle which gives it a very unique look. This also means you can easily use the bag fully open, just in case you need to carry tall items, e.g. a yoga mat or maybe extra groceries. Large external front zippered pocket with built-in admin panel for pens, chargers etc.. This backpack is one of the more popular soccer backpacks with a ball pocket. It’s a great game day bag, and is also a great gym bag. Unlike most soccer backpacks with a ball holder, the ball pocket here is cleverly hidden in a zippered compartment on the front, so it stays out of the way and doesn’t take up much space if not needed. 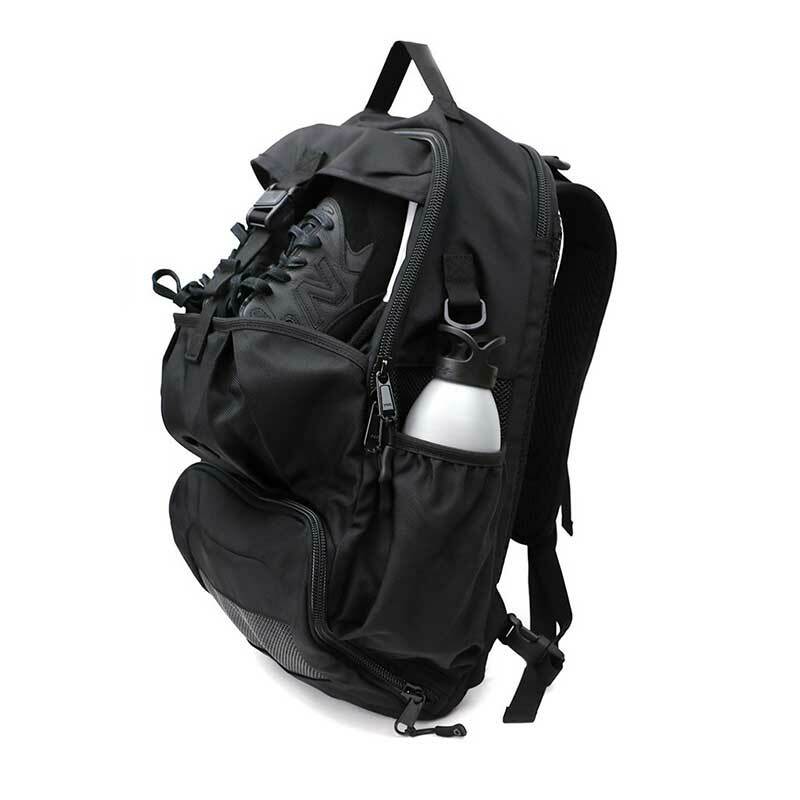 It has a nicely designed vented front pocket that’s perfect for shoes or wet gear. Vented, mesh front compartment for shoes or used gym clothes. Deployable ball pocket – great for volleyballs or soccer balls (does not fit basketballs, but you can stick a basketball in the main compartment if you want). 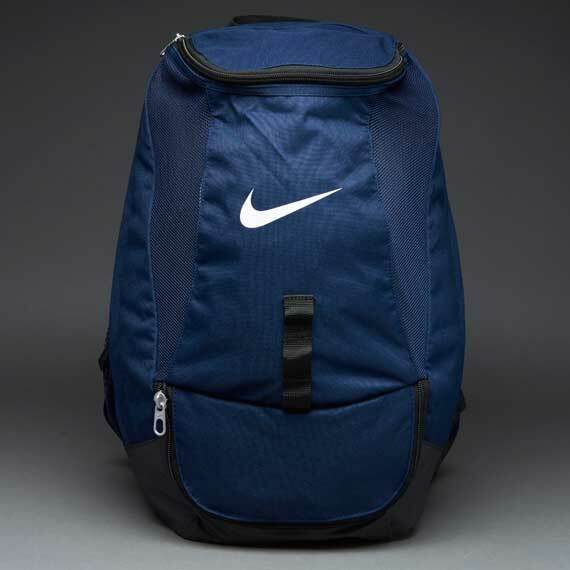 Buy the Nike Club Team Swoosh Backpack on Amazon. This is one of the more unique bags on this list. 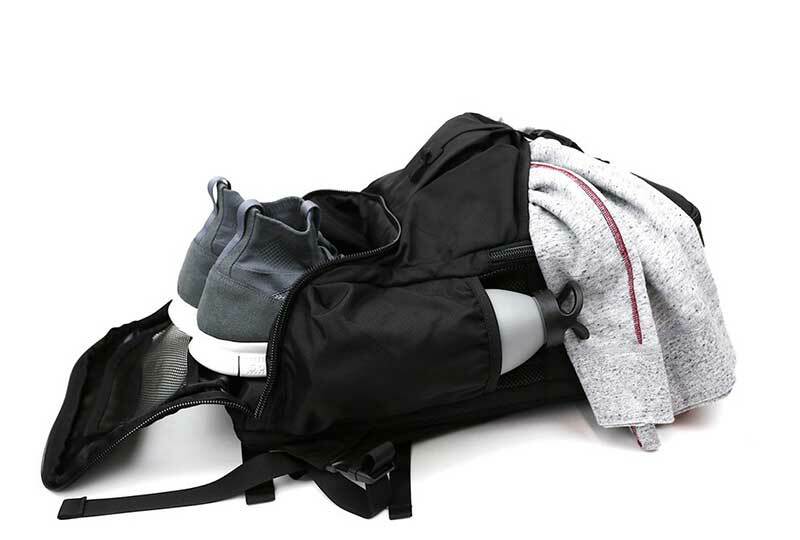 This is a gym backpack with a separate shoe compartment, a dedicated laptop compartment, a dedicated tablet sleeve, and a very cleverly designed external carry system that can carry an additional pair of shoes, wet clothes or can serve as a ball pocket or holder (it can carry a basketball, volleyball or soccer ball). The main story here is ventilation – every compartment here (except for the dedicated laptop compartment) is ventilated. Padded laptop compartment – fits up to a 15” laptop plus a separate tablet sleeve with buckle closure in the main compartment. Internal accessory pocket built into the front panel – for your keys, wallet, lipbalm, eyedrops etc.. If you’re looking for a bag to carry your gym essentials as well as your office gear, we’ve got 5 bags that will look great in the office. It doesn’t matter whether you want to go to the gym before work, after work, or in the middle of the day – these bags will help you transition from the office to the gym, or vice versa. Here, we focused on gym bags that can carry your gym essentials as well as your office gear (e.g. your laptop). We’ve put a premium on aesthetics here, we’ve carefully selected bags that will blend-in in a professional environment. Understated, with minimal branding is what we’re looking for here. Bags that’ll go well with whatever you wear to work. You will not find it embarrassing to carry these in the office. 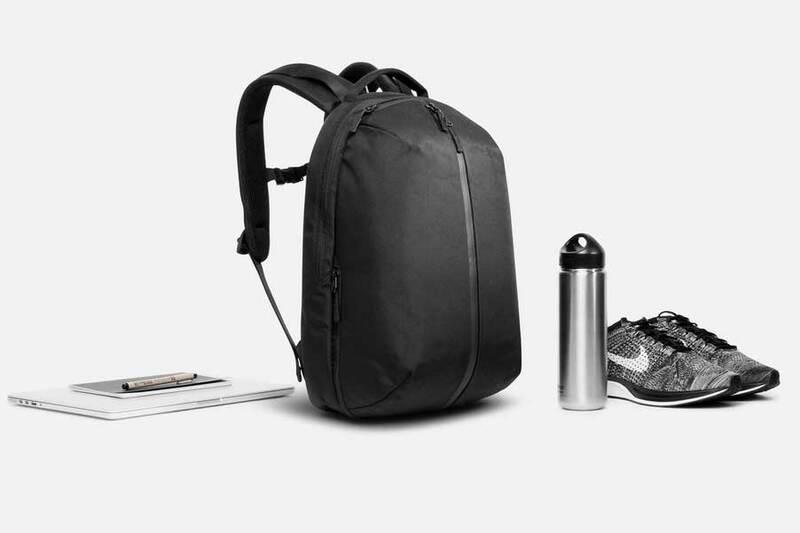 This is a relatively small backpack, and is perfect for work and gym essentials. The best thing about this pack are the clearly defined main compartments – an “office” compartment on the side closest to your back, and a “gym” compartment on the front with a duffle-style vertical zipper (you wouldn’t want to be pulling out your workout shirt when you’re fishing out your laptop in a meeting would you?). The front duffle-style compartment shares space with the separate shoe compartment on the bottom while the back compartment has separate laptop compartment, a tablet sleeve and 3 pockets. This is a great looking pack, with a very clean aesthetic on the outside, with the only branding being a small Aer tag on the side of the bag – but the inside still features enough organization to satisfy non-minimalists. Work or play, these gym bags have you covered. 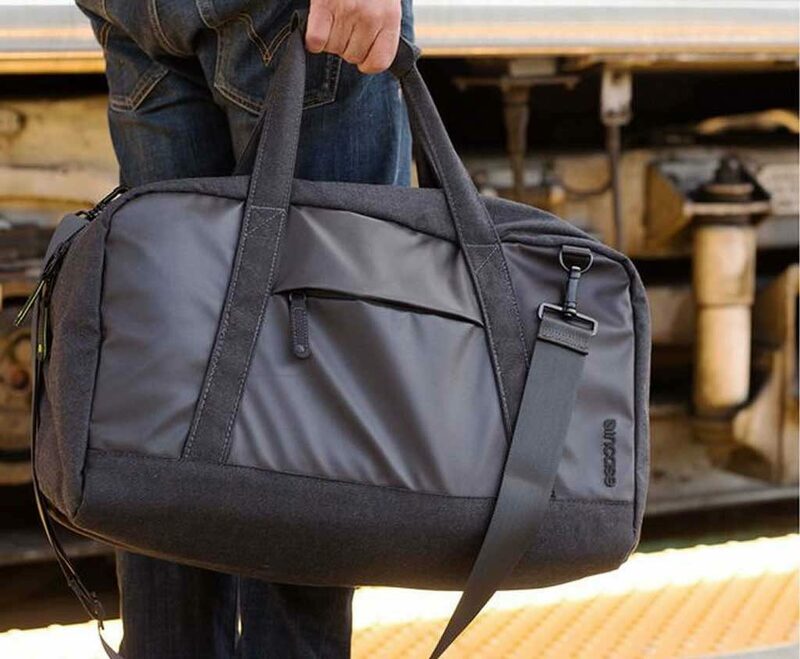 Similar to their gym/work backpack version above – this duffel is designed for the gym and the office. It features 2 compartments – a padded laptop compartment, and a large main compartment with a separate ventilated shoe compartment with side access. 1 external zippered pocket for quick access to keys, gym card etc..
Office ready, gym ready, travel ready! The EO Travel Duffel is primarily designed as a travel bag, so it doesn’t have gym friendly features such as a shoe pocket. But it features a very spacious main compartment and a separate laptop pocket (padded and lined with a really nice material, we have no idea what it is, but it is niiice…) that is perfect for someone looking to jump from the cubicle to the gym. Dual padded haul handles and a removable shoulder strap with a shoulder pad are included. Buy the EO Travel Duffel on Amazon. 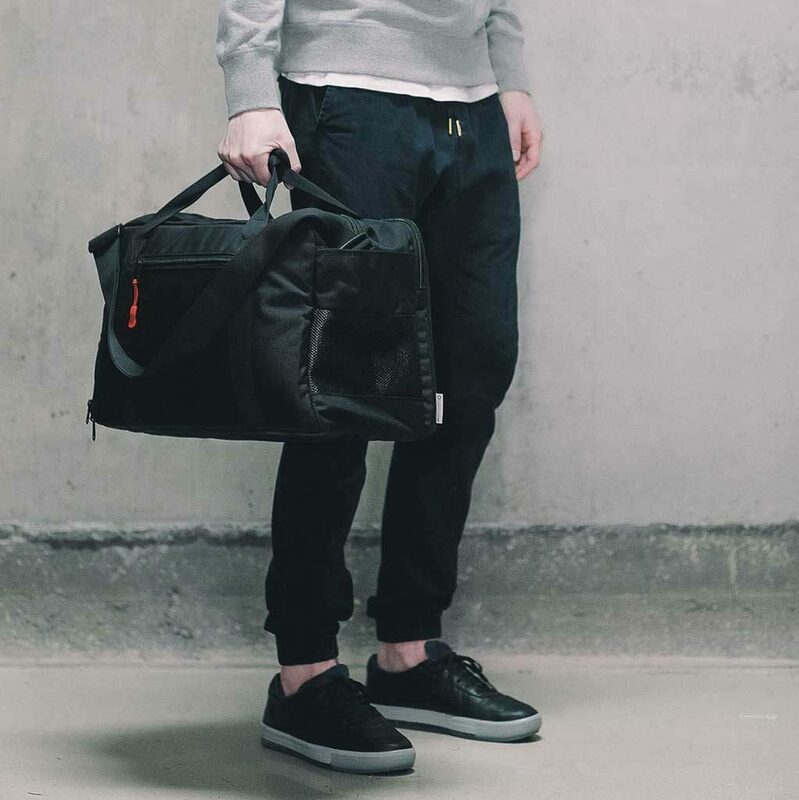 The KP Duffle Bag in black. Click here to get the KP Duffle on Amazon. Also available in other great colors. Aer calls this pack a mobile office, and in many ways, that’s a great way to describe this pack. It’s a backpack, with a duffel built on top of it. Or, if you prefer, it’s a gym bag with a laptop compartment. 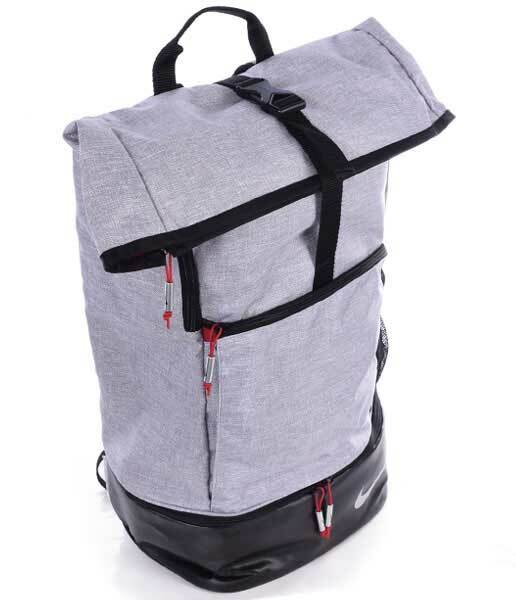 At 22” high, this is a relatively tall backpack, but at only 7” at it’s deepest, this is also a very slim pack. The office/laptop compartment (closest to your back) has space for up to a 15” laptop and also has a separate table sleeve. The main compartment on the front opens duffel style and has a vented shoe compartment (fits up to US Mens size 13). 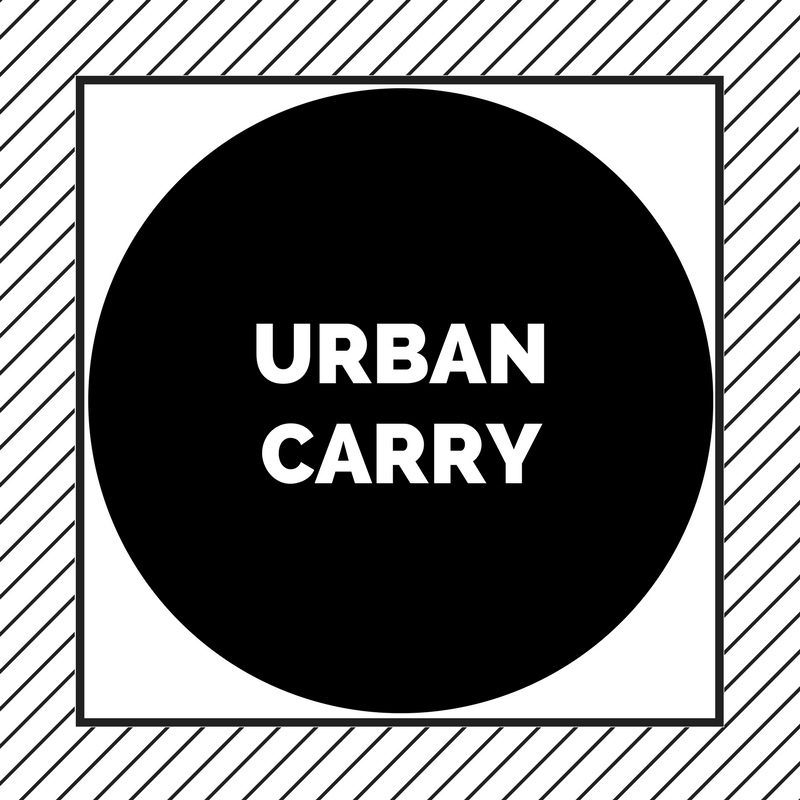 Each side of the bag has quick access pockets, which can fit your phone, wallets, notebook etc..
Backpack straps (primary carry); plus padded top and side handles – carry it like a briefcase at work, wear it like a backpack on your way to the gym! This is as simple as it gets. This is slightly smaller than your typical gym duffel and it only has one compartment, with no pockets at all, inside or out. But if you want to keep it simple, and just want to carry a pair of shoes and a change of clothes and maybe a towel and toiletries, this is the perfect small gym bag. And, it’s also available in a variety of colors. Includes a stiff, but flexible bottom, which helps in keeping the shape, and in not making the bag sag too much under heavy weight. 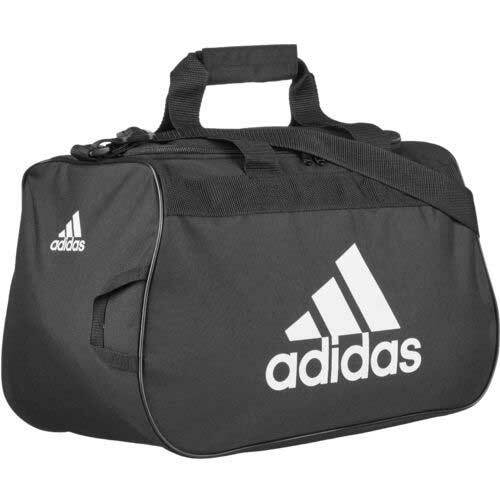 Click here to shop the Adidas Diablo Gym Duffle on Amazon. Also available in a ton of colors! 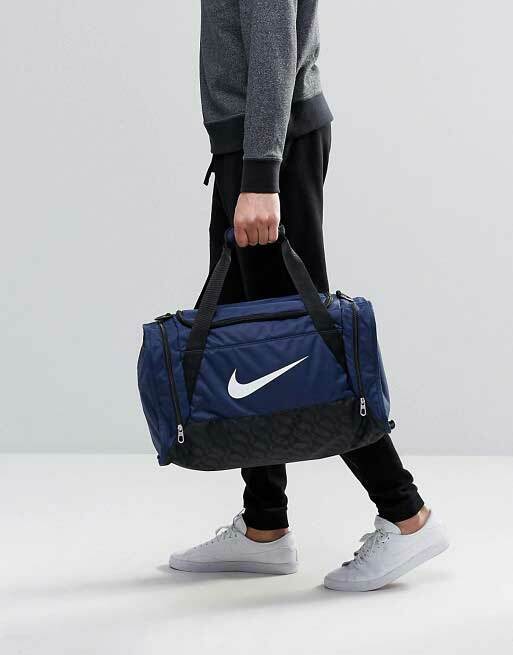 The Brasilia Duffel is one of Nike’s most popular budget duffel lines. It’s available in a variety of sizes (from extra-small to large). For regular gym use, you’ll want to take a look at either the XS or S, perhaps the M if you need more space. The large duffel, at 28” long is just too big for most people, unless you’re carrying tons of extra specialty gear. The XS size in particular is perfect if you want a really small duffel for only the essentials. There is one interior pocket for your valuables, a separate shoe compartment that’s slightly vented and an exterior mesh pocket. The big downside is that it doesn’t have a stiff bottom, so it will sag a bit if fully loaded. But since it’s not a large duffel (the XS is only 16” long) it’s really a no biggie. Separate shoe or used clothing compartment, with slight ventilation (the vented area isn’t as big as most bags, not great if you want to air something out quickly, but good if you don’t want people on the subway staring at your gym shoes in the bag). Available in a variety of sizes – XS is great if you want something smaller than usual, the S is about the size of most regular gym duffel bags. M and L are probably too big for most people. Made of lightweight polyester, the downside is it doesn’t have much structure, but on the flipside, it is one ultralight bag. 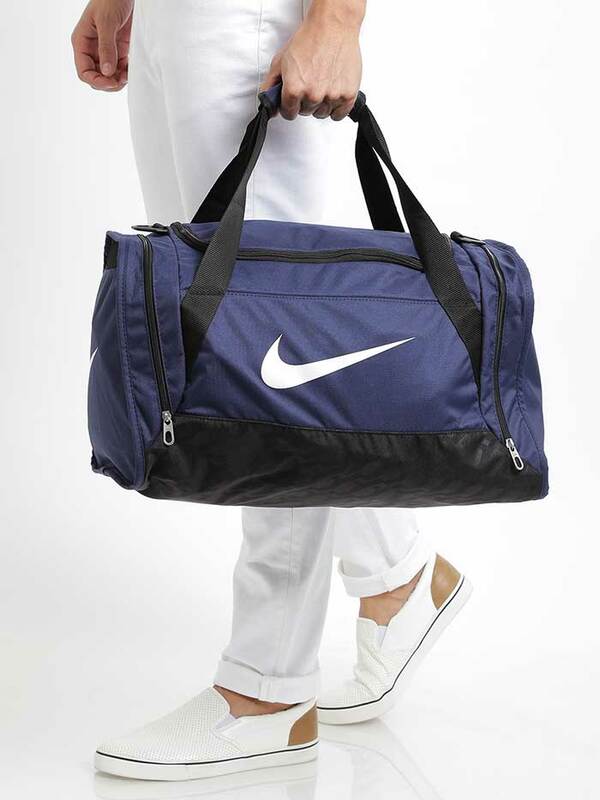 Click here to shop the Nike Brasilia Duffel line on Amazon. 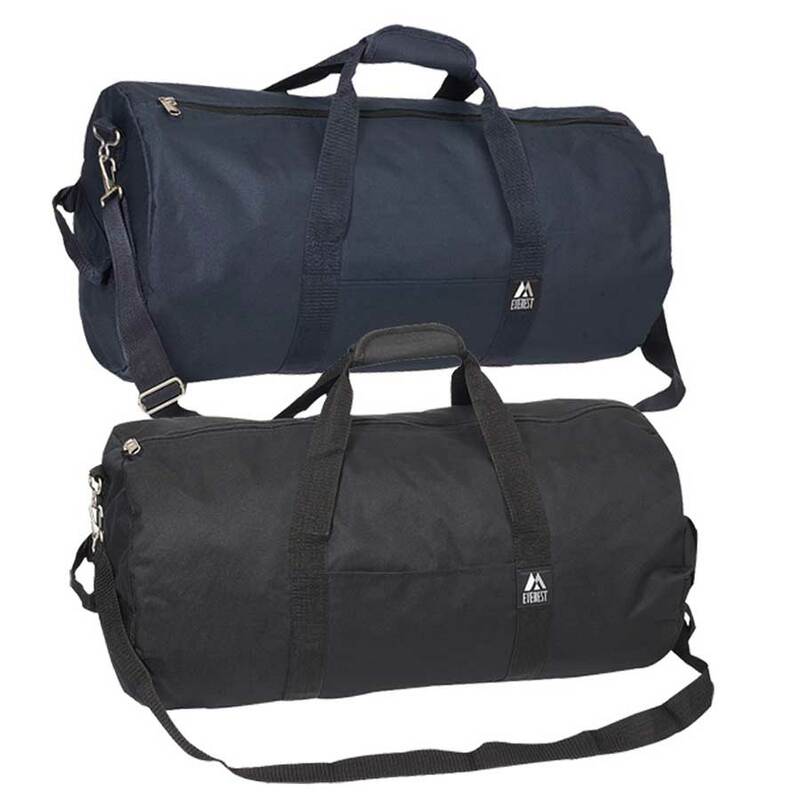 This barrel duffel is even smaller than the Nike Brasilia in XS (above). Even though the specs say it’s only an inch smaller in height and depth, the difference in real life is actually quite significant because this is a round duffel. This is almost as no-frills as it gets – there is no interior organization here, no separate shoe compartment or vented mesh. But in a bag this small, you don’t really need a lot of organization. The only “feature” here is a single exterior pocket. Great size if you want something really small. It’s also a great emergency bag to leave in the car, and if you’re a light packer, it can do double duty as an overnight bag. Did we mention it was small? Again, if you want something as small as possible that can still carry your gym essentials, this is about as small as you want to go. One more time, just in case you missed it – this is a small duffel! It’s so small, you can even use it as a carry-on with Spirit Airlines or other small regional jets without the gate agent giving you the stink eye. Buy the Everest Small Round Duffle on Amazon. One of the more popular gym bags for women right now. 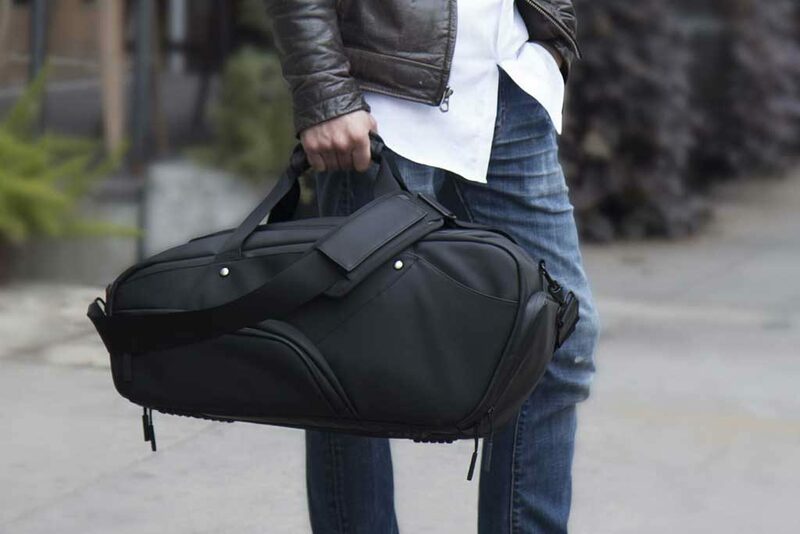 This bag isn’t as small as the bags above, but it still maintains a very sleek profile. This bag also has pockets galore. There’s a separate shoe compartment with minimal venting (good if you don’t want people to easily see the contents of your bag, but not great if you want to carry wet stuff). The great thing is that the shoe compartment is lined with patented freshPAK™ anti-microbial technology which helps take care of odor-causing bacteria. The main compartment has 3 interior pockets (one is lined with tricot – great for jewelry or other items that you don’t want scratched), and there are 2 exterior pockets. 5 pockets! On the inside, one side of the bag is a large mesh pocket. Opposite this is a small floating pouch with two organizational pockets – helpfully labeled as for “little stuff”. One of these pockets is lined with a soft material, so it’s perfect for earrings, bracelets and other jewelry. On the outside, there is a nicely sized zippered pocket on the front, and on one side there is a stretchy mesh pocket for your water bottle or anything else you want quick access too. Great color selection – these are really some of the best looking gym bags we’ve seen. The Adidas logo is “pearlized” which gives it a really nice, unique look. Top haul handle, with adjustable shoulder strap, and small grab handles on each end. 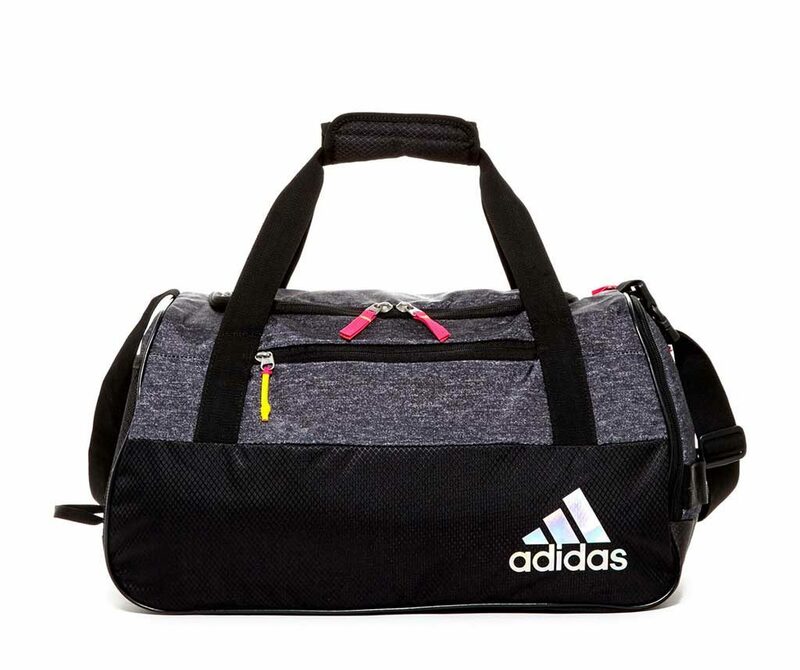 Shop the Adidas Squad III Duffel on Amazon. Also available in other colors! 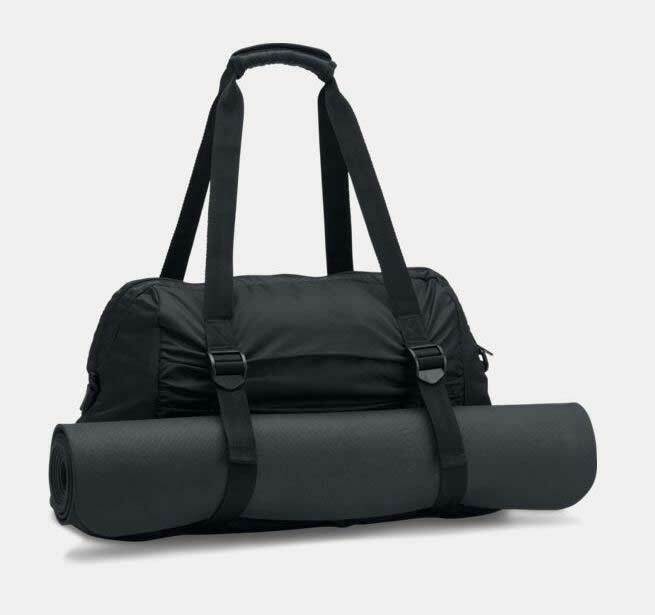 This is the only bag on this list with a dedicated yoga mat holder. And unlike all other bags on this list which are either backpacks or your standard duffle bag, this one is a tote bag. It’s made of Under Armour’s patented UA Storm™ polyester, which is a highly water resistant material. And in a big departure from your usual Under Armour gear, this bag has minimal branding (Surprise! We typically stay away from most UA gear because of the over the top branding, but this one is pretty good). 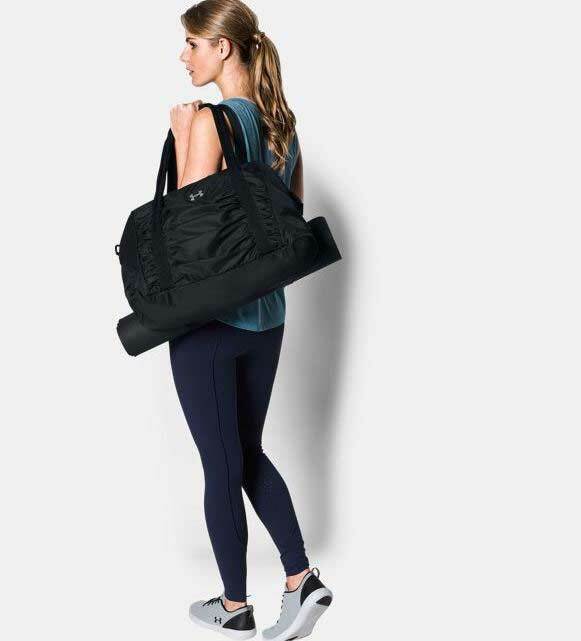 Shop the Under Armour The Works Womens Gym Tote on Amazon. This bag is available in 4 sizes – 30L, 50L, 70L and 90L. But you’ll most likely want the 30L as a gym bag. The 50L if you’re carrying lots and lots of gear (but be warned, the 50L is a large bag and is going to be really heavy when full). The larger sizes are really best left for carrying specialty gear or for expeditions. With a coated outer polyester fabric, this is a highly water resistant bag. It’s advertised as water proof, but technically the bag itself is not water proof because the seams aren’t sealed and there really is no such thing as a fully water proof zipper. The fabric itself is waterproof – but the construction of the bag isn’t. It will do fine in a rainstorm, but don’t jump in the pool with it. Uniquely, this bag has hidden backpack straps that you can deploy if you prefer backpack carry or if you want both hands free. This is for those needing a roomy carry-all for the gym. Although this bag is available in 3 sizes – we recommend the small size for regular gym use. With a 50L capacity, the Small size isn’t really that small. The medium size is a staggering 70L and is going to be way too big for most people. Featuring a ventilated shoe compartment, this bag is made of water-repellent hydroshell™ coated and rip-stop polyester and is a popular training or game day bag. 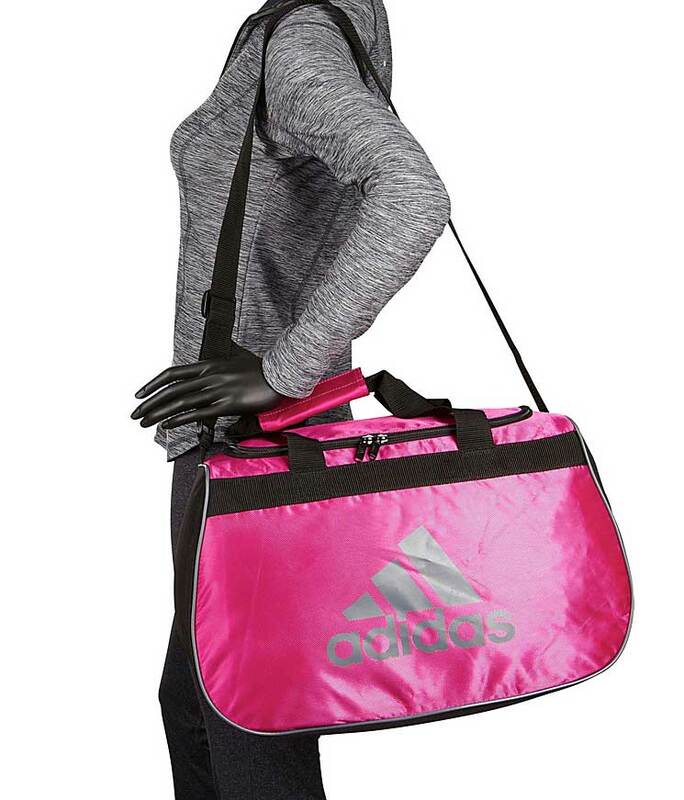 The bottom of the bag features Adidas’ ClimaProof™ which helps protect your gear from a wet field or gym floor. The budget pick – this is one of the most popular budget gym bags out right now. It’s not large, and can easily fit in most gym lockers. There is a separate vented shoe compartment (Everest calls this a wet pocket) – but because of the relatively smaller design of the bag, this will take up a large part of the main compartment. It’s not built to be abused, and it won’t win top marks for the most stylish gym bag, but for the price, it is a great budget gym bag. This is a larger duffle than the Everest Gym bag above. 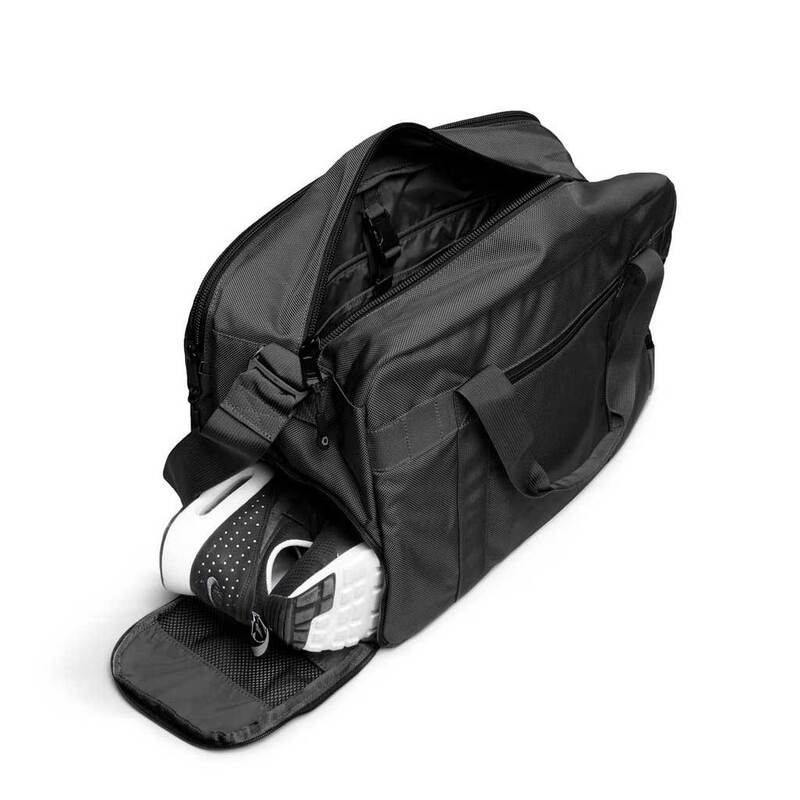 It also features a separate vented compartment, for shoes or used gym clothes. There’s a large zip pocket on the front that spans the entire length of the bag and a zip pocket on the opposite end of the shoe compartment. This is a nicely sized hold-all, great if you carry more gear, or if you want a gym bag that can also double as a weekender or travel bag. If you want something with less of the “I’m going to the gym” look, the Shackes Duffle is a great alternative to the Everest bag above. This bag also has a separate shoe compartment, but it isn’t vented, which helps with aesthetics. The good thing about this bag is that it can easily double as a nice-looking weekender, overnight bag or carry-on bag. Floating inner zipper pocket for your valuables – wallet, passport etc.. This is the only packable bag in this list. It can fold down into about a 9” x 9” square, so you can easily drop this in any bag and only deploy it when needed. Because it’s a packable bag, that means the bag doesn’t have any structure at all.